The General Store is our handicap-accessible cabin. We adorned the exterior with old washboards, wagon wheels, saws, horsewhips and other late 1800s merchandise. If you’re browsing Big Bend National Park cabins and need to find accommodations with wheelchair access, you’ve found the perfect spot! 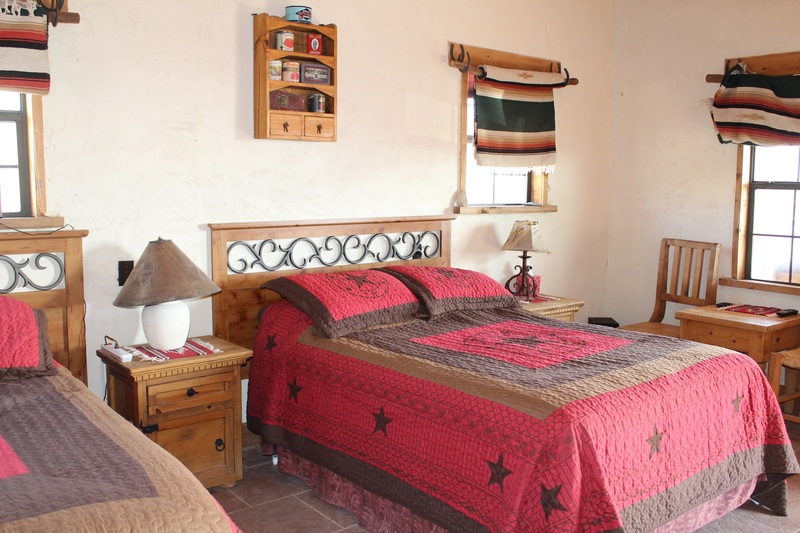 The General Store cabin accommodates up to four with two double beds, flat screen HD TVs (Dish), a private bath, a gas log fireplace, air conditioning, Wifi access, and a large covered front porch with a beautiful view of the Chihuahuan desert. As part of our overall design, each Ten Bits Ranch (XBR) cabin plays a role in creating our old west town. But don’t worry, you won’t have to sacrifice modern amenities. Not only do we have high-speed WiFi, our entire ranch is supported by the most reliable energy available: solar power! That’s right, we’re off the grid but you can rest assured we’re more reliable than the energy companies. When you consider your options for Big Bend National Park cabins, you won’t find a more convenient spot. We’re a short drive to Terlingua and Study Butte. But we’re far enough away to rest and relax in the surrounding desert and mountainous topography. Big Bend National Park and the Santa Elena Canyon Trail are right around the corner too. Whether you enjoy a simple hike through the desert trails or want high adventure with your ATV or sport-bike, Ten Bits Ranch will provide a secluded get-a-way you will not soon forget. We fill up quickly, as do many Big Bend National Park cabins, so make your reservation today. Call or email us – if we don’t answer, we’ll get back to you quickly. If you require a handicap-accessible cabin, please make sure to request The General Store.